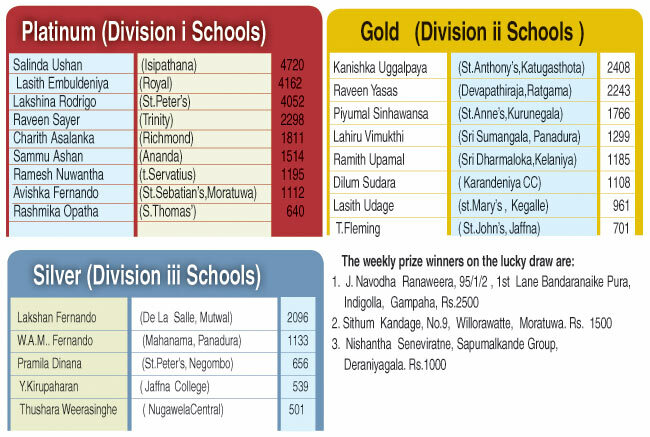 There were two major changes at the top as Salinda Ushan Perera of Isipathana College ousted his two closest rivals, Lasith Embuldeniya of Royal College and Lakshina Rodrigo of St.Peter's College to take the top spot in the platinum contest at the end of the 6th week count in the Sunday Observer/Mobitel Most Popular schoolboy Cricketer contest 2016. Salinda Ushan of Isipathana , a Sri Lanka under 19 school representative polled in 4720 votes to Lasith Embuldeniya's 4162 and Lakshina Rodrigo's 4052.In the division two 'gold' contest St. Anthony's Katugasthota's Kanishka Uggalpaya was placed first with 2406 votes to oust Raveen Yasas from Devapathiraja who polled in 2243 votes. Piyumal Sinhawansa of St.Anne's College, Kurunegala took the third place with 1766 votes displacing Lahiru Vimukthi of Sri Sumangala, Panadura. There were no changes in the Silver contest as Lakshan Fernando of De La Salle College, Mutwal remained at the top with 2096 votes.